(the site that everyone who detests the "world's biggest club" should visit), where the column originally appeared. Yeh, I'm still alive and kicking - busier than ever and as in love with the game as I was as a nipper! 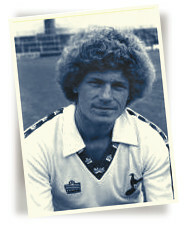 With any luck you will remember me from my days at Spurs when I was pretty handy on the field. And of course I spent some time at Chelsea and a couple of years with Ossie Ardiles and Glenn Hoddle at Swindon. I spent more than 20 years in the game - man and boy as they say - and what a time I've had. But you may be surprised to learn that I get as much (if not more) satisfaction from what I do now - coaching the young ones ! That's what I came on to talk to you about. Any lad who ever kicked a ball probably dreams of glory - lifting a trophy and hearing the cheers of adoring fans. These are the lads I coach, and I want to help you get closer to living out that dream for yourself. It won't be easy mind! Every week I'll be telling you something different. What I won't ever tell you is that it's easy. There are dozens of clichés on the "no pain, no gain" lines and there's a great deal of truth in many of them. Every week I'll be telling you something different. What I won't ever tell you is that it's easy. There are dozens of clichés on the "no pain, no gain" lines and there's a great deal of truth in many of them. Take me for example. I grew up in Sunderland and I played footie in the streets with my mates and I played at school, in fact I played every opportunity I got. And every time I had a ball on my foot I was playing in the World Cup final! That's what drove me on. I got picked for my school team and I played in the county and as luck would have it I played a terrific game the day the Spurs scouts turned up to watch. I was still only a nipper - barely a teenager - and too young to go down to London and join them. So I trained hard and looked forward to the day when I could. I have a great deal to thank my dad for 'cos his influence was brilliant. He wasn't pushy and he wasn't critical - he just helped to make me the best I could be. I have two brothers who were also pretty good but they weren't so interested - you see you can't be forced - you either love it or you don't. He understood that and encouraged me at all times. I didn't need a push - I was smitten- I never ever went to Roker Park to see a match. I used to find a field and a ball and play. The only time I took time off playing footie was to watch the cup finals! Then at 14, I went to Spurs training for a week at a time until I was 16, when I moved down to join their youth squad as an apprentice. Boy was I homesick - I ran home six times by the time I was 18 !! Lucky the coaches were patient with me and eventually I settled. My family was still very supportive - my dad, two brothers and four sisters used to come and watch - used to cost me a fortune in tickets! I was in the first team at 19 - my first match was against Everton and we won 3-0! For a debut it was a good game and my family was there to watch it. I had some bad games mind though! I had flair and imagination but I was erratic. Well that was the start - 1980/81 season. I got my trophies and a whole sackful of terrific memories and now I've moved on helping the kids, and I love it. Playing was great but I still get the biggest buzz from seeing my lads do the best they can.